Thank you so much for being wonderful to work with. You all have made my life SO much easier and better. I promise to do all I can to help your businesses grow and flourish so that you can help others the way that you have helped me. Felicia, you are top notch! What a responsible responsive enthusiastic reliable agent you are. Although I've not been in the home searching business for 40 years, I could not have anticipated the degree of professionalism and trust demonstrated. I sincerely appreciate you! And the above praise is not exaggerated but more than DESERVING! ...Just wanted to put a plug in for Kimberly, she went above and beyond the call of duty today helping me pick up a radon machine. The other agent told me the owners would be home and when I got there it was locked up tight and dark. I called Kim at 7:30 on a Sunday evening and she came as soon as possible to let me in, with all her sisters and brothers in the car with her. She bailed me out! Kim has been the nicest, most courteous and most helpful person I have had an opportunity to work with. Her promptness and her professionalism is amazing. I believe as much as we should give constructive criticism, we need to praise when it's appropriate. She is a true asset and wow, how willing to work with me any time, all the time. I truly appreciate it! Dear Leslie and Kimberly, you have renewed my faith in real estate professionals. Thank you for your help! Leslie, thank you so much for all your hard work on getting this deal done. From all my emails to finding the right buyer, you handled it with professionalism and fun! ~ Michael and Lanny G.
Leslie has helped my family sell and buy a house. She worked extra hard to get the offer we wanted when selling and even harder when we were purchasing our current home. ~ Michael & Erika W.
Leslie was extremely helpful to our family on both the buying and selling side of things. She was always quick to respond and get us in to see homes we were interested in. I trusted her opinion and expertise. Leslie is easily the most focused and knowledgeable real estate agent we've ever worked with. Agents we've dealt with in the past have been decent people but they all seemed to be in real estate as a second career or part time job. They did usually get the job done and we figured that was fine and the norm. Then, needing to sell our house in Wichita, we met Leslie. She studied the real estate business at university and has been a full-time pro in the field from the day she graduated. One senses early on that she brings a great deal of energy and enthusiasm to the job - that this is her passion. Her knowledge of the local market and where our house fit into it was both remarkable and reassuring. Throughout the process we felt as though we had someone in command of our sale, with a plan to get it done as promptly as possible at the best price. Which she did. ~ Chuck & Leigh B. We were very particular in our home shopping over a lengthy period of time, so we appreciated Leslie's patience and support. She then helped us sell our old house. We were very pleased with both outcomes! ~ Paul & Diane D.
Leslie was wonderful to work with from start to finish. My wife and I were anxious sellers as we had already moved out of town and couldn't be there to participate in the process. 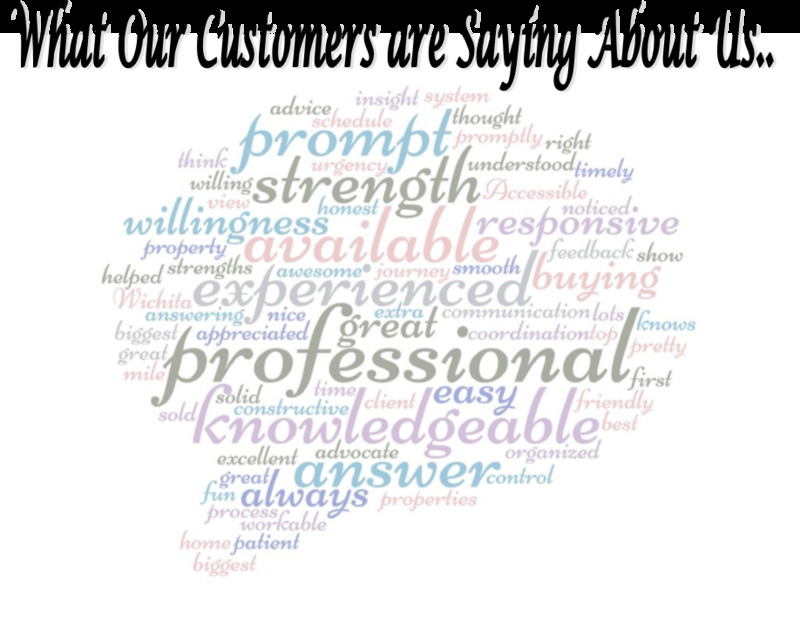 Leslie gave us good feedback on what we could do to improve the home's initial buyer impression. The quality of photos and video tour on our listing was amazing. Our home never looked so good. Within 3 days of our home being on the market, we had over 20 showings and received an offer above our asking price. Leslie helped us secure a back up offer should the first offer fall through. She guided us through the maze of documentation and negotiating for repairs after the home inspection. Our home closed without a hitch. I was amazed by how simple the selling process was made with Leslie's help. She was always patient and very responsive to our many questions. Thank you, Leslie, for everything! Leslie is personable, attentive and great to work with. We have now purchased two homes and sold one with her help. She made the process easy and as stress-free as possible. ~ David & Jena C.
This was our first experience buying a home and Leslie was invaluable to the whole process. She was very prompt and thorough in all aspects including looking at listings, setting up inspections, getting estimates and the negotiation process. She held herself and everyone we worked with to the highest standard. I would recommend her without a doubt! I had a great experience with Leslie. She is very professional and pays attention to detail. Her dedication to her job shows. She is easy to get in touch with and always responded in a timely manner. I would highly recommend her. ~ Matt & Felicia W.
Leslie has helped my husband and I sell one house and purchase another. She is an awesome Realtor and should we ever need to sell our current house, we would definitely contact her again!!! Leslie is wonderful to work with. Friendly, knowledgable, professional. I would highly recommend her. We used her to help us buy a home. We ended up deciding to build and she has continued to be immensely helpful in the land buying and building process. We have no complaints. If we ever decide to move, we would have no hesitation having her list and sell our home. ~ David & Laura M.